I won this in a contest on the E-Cigarette Forum. Heaven Gifts was the sponsor. As such, I am relaying only my views and opinions. This is a tiny-ish, yet solid feeling device that will fire up to 75 Watts and down to 5 Watts. 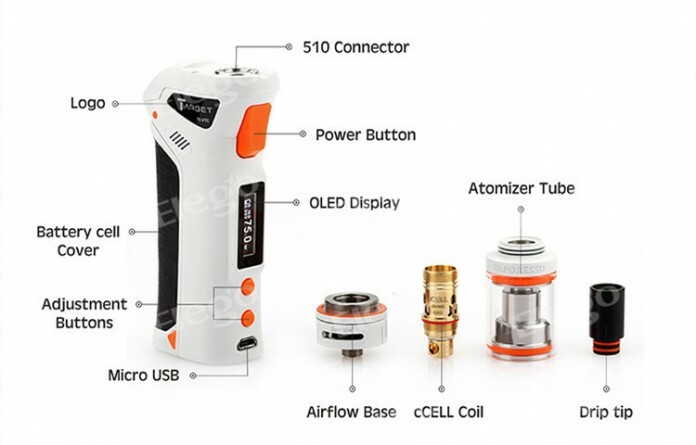 It will also operate in Temperature Control mode with Ni200 coils. The temperature range is from 200 to 600 degrees Fahrenheit or 100 to 315 degrees Celsius. It will fire down to .15 Ohms and up to 3 Ohms. 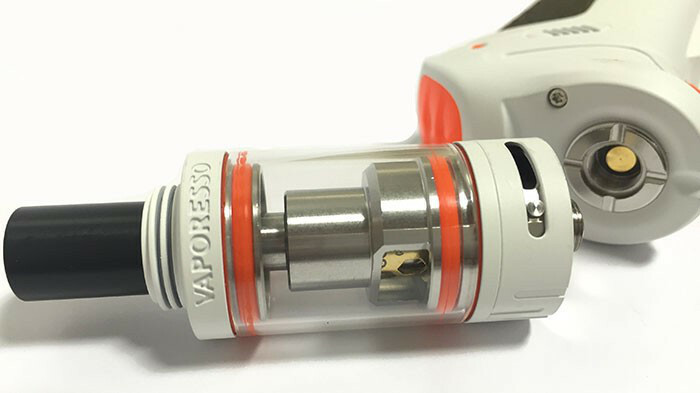 It claims to have automatic atomizer recognition. The mod operates on one high-drain 18650, so your battery life will be in part dependent on the battery you choose (I recommend LG HG2 Chocolates), and the wattage you are running it at. The complete kit comes with the Target tank, the mod, a manual, and a USB cable, and two cCell ceramic coils (one in the tank and one tucked into a foam cutout in the box) all nicely presented in a very nice box. The pricing on this kit is relatively competitive. I have found it ranging between $55 and $90. Since I won this from Heaven Gifts, that is who I will link to. Their price is right in the middle at $76. The device itself is rather ergonomic. Initially, I was not a fan of the pistol grip shape just because it is a pistol grip. With people being shot daily for holding something that resembles a pistol, I saw this as being a con. Now that I have it in my hands, it's very nice. Smaller than a pistol grip... more like a high-end joystick (which is what the company states they intended). It is a bit small for my hands, but very comfortable nonetheless. I find I am happiest using it with my pinky curled under the mod, three fingers resting on the front (the index finger on the trigger, the middle finger on the display, and the ring finger above the adjustment buttons), and my thumb falls naturally on the thumb rest. The grip is smack-dab in my palm. It measures 92 x 48 x 27 mm, but those measurements mean very little because of the slants and curves incorporated into the device. With an 18650 installed and without a tank, the device weighs in at 170 grams. From the top down, there is a steel threaded, spring loaded 510 connection in front and a color coordinated "thumb rest" in back. The 510 does have cutaways for allowing airflow to get to the 510 if needed (and wouldn't you know it... as soon as I wrote "who uses 510 air any more? 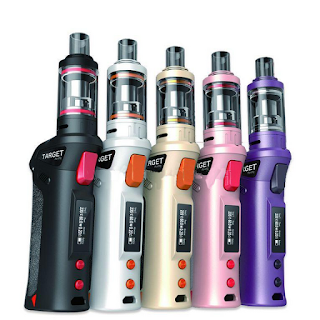 ", Innokin came out with the Prism tanks for the Endura line of products and they use 510 air). On the front, under the 510, we find a color coordinated trigger style firing button, a raised OLED screen with a flush cover and a black bezel, two color coordinated adjustment buttons helpfully labeled "+" and "-", and finally a micro USB port. On one side, there is a tastefully small logo placard set into a small recess. Other than that, the two sides are identical and have a small, color coordinated Torx screw above the grip, battery and chip venting slots, the textured grip, and small arrows indicating how and where to remove the battery door. There is additional battery venting on the bottom of the device as well as a fingernail lip to remove the battery door. The back of the device, under the thumb rest, is almost entirely the textured grip with the company name discretely engraved into the texturing. The grip IS the battery door. It can be opened by grasping at the bottom where the arrows indicate or by inserting a fingernail into the lip underneath and swinging it out. The door is held in place by two magnets - one top and one bottom - and a unique kind of hinge tab at the top. The door is swung out about 25 degrees and then pulled down to remove. In order to install a battery, the door must be completely removed. The Target tank is also color coordinated. It is a bottom filling, Atlantis coil compatible tank that holds 3.5 ml. It comes with a plastic 510 drip tip. At the base of the tank is an adjustable airflow ring that opens or closes two 9.5 x 2 mm slots. There are pins that prevent the adjustment ring from spinning around, and the adjustment is relatively firm. It will fully disassemble for cleaning, and the tank section is Pyrex. The center pin does not protrude and is not adjustable so, for the love of all things holy, don't put this on a hybrid mech mod! As tanks go, it is rather uninspired, but it functions as intended and looks good on the device. It is a 22 mm tank that measures a bit over 46 mm in height without 510 or drip tip. However, the tank is not the show stopper, here. Rather, it is the coils that come with the kit. 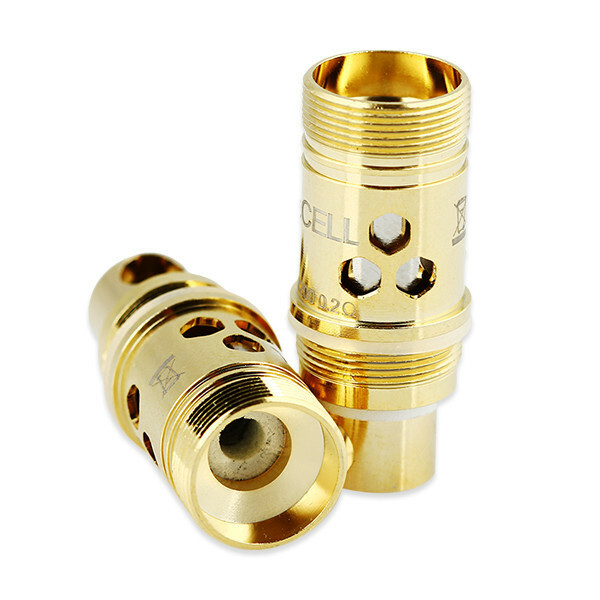 They are called cCell ceramic coils and they are very nice. In the kit, there is one .9 Ohm Kanthal coil that will run up to 35 Watts with no issues - possibly higher, but I didn't push it - and on .2 Ohm Ni200 coil. I'll go as far as to state that, because of the ceramics used in the coil, these coils need more wattage. I must acknowledge, here, a bit of hulabaloo created over the cCell coils supplied with the device. Some reviewers said that the coil crumbled and they were fearful or inhaling ceramic dust. Others have said that the ceramic will give off toxic fumes. Personally, I would not worry about either scenario. For starters, the coils are not likely to crumble without being removed from the casing and manhandled. If a strange taste is noticed, or there is some sort of flake residue floating about in the tank I would say that the coil has been damaged by time and is in need of replacing. Secondly, in order to release toxins, I believe that the coil would need to be heated much higher than what any vaper would find comfortable. Ceramics are relatively safe at reasonable temperatures and have been in use for a long long time. Think about that the next time you put some leftovers in a microwave setting on a ceramic plate. Finally, Vaporesso has released the MSDS (material safety data sheets) for the devices and there does not appear to be anything wrong with them. Having written all of that, once these coils are used up, I will not be using them any more because I like tanks I can build. Since this tank takes Atlantis compatible coils, I can use the Melo 2 RBA head, the Project Sub Ohm Saucecode RBA, or the Anyvape Furytank RBA head. Pressing the - and fire button locks the resistance ONLY in TC mode. In wattage mode, this key combo does nothing. Pressing the - and + buttons simultaneously switches the device from Wattage to TC and back again. Pressing the - or + buttons in power mode increases or decreases the Wattage in .1 Watt increments. Holding down the button engages an accelerator that is not that fast, but gets there eventually. The Wattage range is from 5 to 75 Watts. Pressing the + or - buttons in TC mode increases or decreases the temperature in 10 degree increments for Fahrenheit and 5 degree increments for Celsius. The temperature will round-robin up or down. The temperature range is 200 to 600 degrees Fahrenheit or 100 to 315 degrees Celsius. How's it work? Well enough. I have run about nine tanks of e-liquid through it and have used it with an RDA. Of those nine tanks of e-liquid, five were on a .15 Ni200 coil built into an Anyvape Furytank RBA section, One was using the stock .2 Ohm Ni200 coil. The remaining three tanks were using the stock .9 Ohm (read in at .86 Ohms) Kanthal coil. The temperature control works better than expected. I did not notice a pulsing, but when looking at the display, the wattage was continuously adjusting, and the wick never burned. The battery life is a bit above average (when compared to other 75 Watt, single 18650 devices such as the Sigelei 75 and the eVic VTC Mini). The kit looks sharp, too. I have the white model (it is available in white with black and orange accents, black with red accents, stainless with black accents, pink with pink, and purple with purple. I seem to recall seeing it in a champagne or rose gold with black accents at some point, too), and I feel like I should be running around fighting rebel forces on Endor. Very stormtrooper... It's a solid feeling device, too. There is no play in the battery door and no button rattle. The screen is quite easy to read. 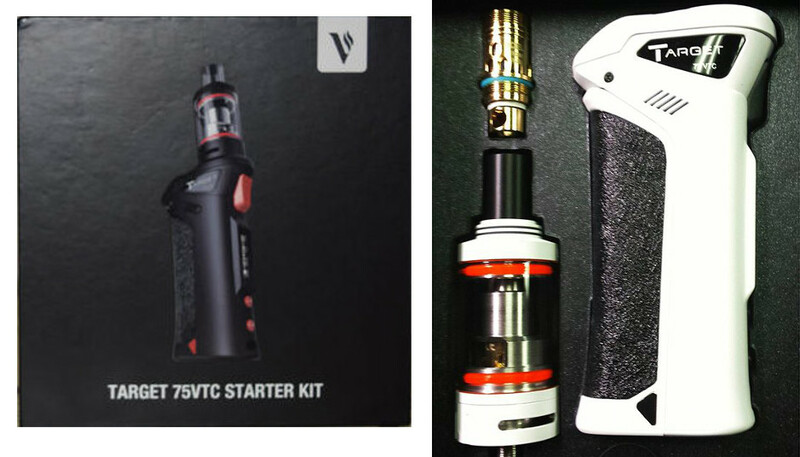 Not all is perfect with the Vaporesso Target 75VTC, however. The Automatic coil recognition worked great when I installed a Kanthal coil on the device set in TC mode. It recognized the change, told me about it with a "Not N1200" message and switched back to the last Wattage settings. The device did not switch automatically when a TC coil was attached, and would have happily let me continue to vape on a Ni200 coil in wattage mode. I also found a few small nicks in the finish of both the mod and the tank. The nicks are tiny tiny tiny, but I found them. The spring loaded center pin is not terribly springy and I have noted that a lot of atomizers do not sit entirely flush. This is due, in part, to the 510 itself sitting a bit high in the device (which might be a conscious decision on the part of the designers to prevent atty rash). In operation, I am happy with everything except the automatic coil detection. I would really like to see this device get Ti, SS, and adjustable TCR modes, but as I find nothing on the website or in the documentation that indicates it might be upgradeable. Before I provide the final grade, I have to tell a story. I actually received two of these kits. The first one was DOA in that the device would not read any atomizer I attached. I contacted heaven Gifts and explained what was happening, including providing a video clip. Within a few hours, another unit was on its way to me. The new unit arrived - shipping from China - in about five days with a weekend in the middle. THAT, folks, is customer service! And, remember, that this was for a win. I offered to return the defective unit, but they said that if having two tanks was an issue, I should pay one forward, and I will... Where this missive speaks volume as to Heaven Gifts customer service and shipping speed, it also hints that Vaporesso might, just might, have a QC problem. It's just as likely that I got a lemon and every other device will be pristine. Now, on to the final grade? Finish - 9/10 - A solid feel, lack of battery door play and button rattle are enough to offset the small dings I found in the finish. Form - 10/10 - Very ergonomic! All the buttons are quite clicky and responsive. Function - 7/10 - Faulty coil recognition and a lack of other TC modes really bother me at this stage of the game. Final - 8.7/10 - B+ grade. Even with its faults, I find myself really enjoying this device. If at any time I were to lose or destroy this device, would I replace it? That's a tough question. It's a good device and I would happily recommend it to anyone wanting to move from something akin to an iStick 40 or 50, if they liked the shape and color. However, at my present level of vaping, I would not replace it as I really think SS is the way to go in the future.